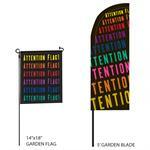 Custom Printed Garden Flags Any Design, Any Quantity! 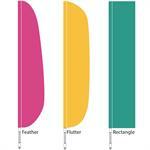 Make yourself known when you purchase custom feather flags, as well as blade and teardrop flags from Attention Flag. Our number one job is to help you get your business or event noticed. 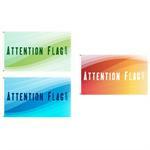 We feature a wide array of high-end flags to help bring attention to your business, such as flutter, premium 90, sharkfin, and blade flags that feature your company’s logo or message, as well as selections in stock colors. Furthermore, we provide quality table covers, retractables, backdrops and banners and now 10' x 10' tents!